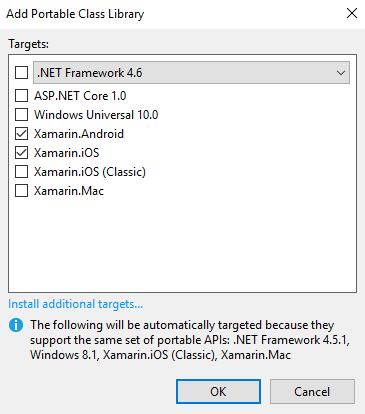 is a Microsoft owned software company that provides cross platform implementations of the .NET Framework that target Android, iOS and Windows devices. With increased support in Visual Studio it provides a common development experience for .NET developers to create cross platform applications. The most common usage is to develop applications targeting Android and iOS mobile devices, thus these applications will be this blog post’s primary focus. 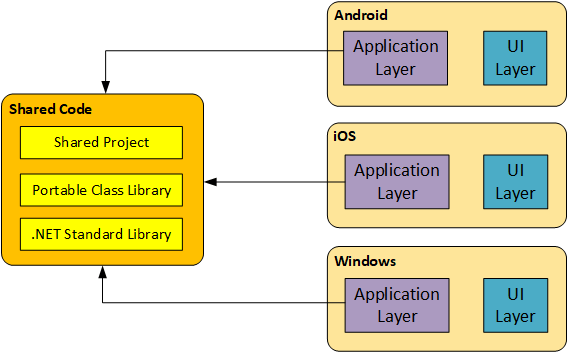 Xamarin facilitates the development of Android and iOS applications by providing the Xamarin.iOS and Mono.Android libraries, as shown in Figure 1 . These libraries are and bridge the gap between the application and the platform specific APIs. layouts – view templates loaded by activities. drawables - icons, images etc. values – centralised location for string values. menus – templates for menu structures. 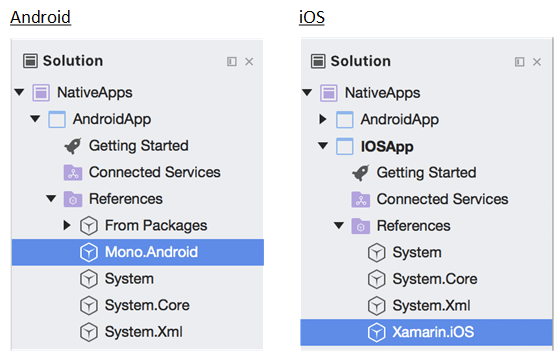 There are a couple of methods that allow code to be reused across projects in Xamarin: Shared Projects and Class Libraries. Figure 4 shows the available options to refactor common code out of the application layer of the platform specific projects. It also illustrates that the extracted code can be consumed by any .NET applications, thus further increasing the scope of its use. A differs from class libraries as the code is copied and included in each application assembly during compilation, thus no separate assembly is created. This non-separation of outputs does have its disadvantages, for example sharing the code beyond the scope of the solution becomes problematic, and unit testing components in isolation from the application is not possible. A is a type of class library introduced to address the issues highlighted with Shared Projects. 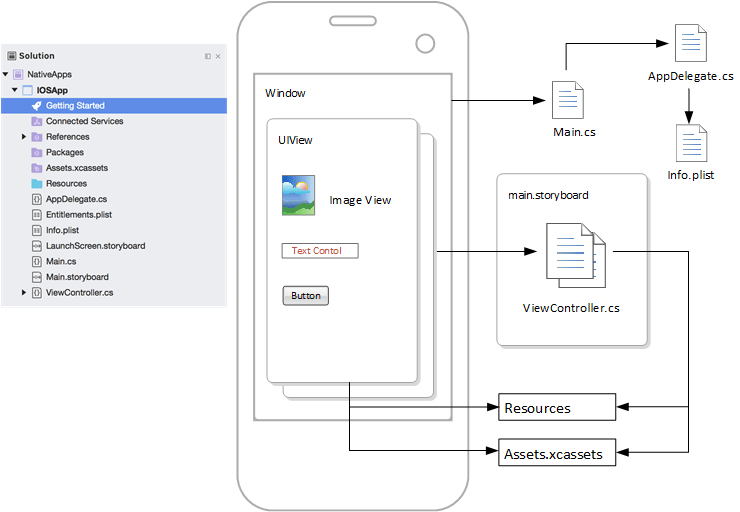 Figure 5 shows an example the available platforms that can be selected, and illustrates that the use of PCL’s is not restricted to just Xamarin mobile applications. The compiled assembly can be referenced by other projects, however there are still drawbacks as the target platforms supported need to be selected on creation. Consequently, only a cross section of the APIs across the selected base libraries are available for use, limiting the available scope. Xamarin, as previously discussed, is based on an event-based architecture in which methods handling UI and business logic would traditionally reside in code behind files. 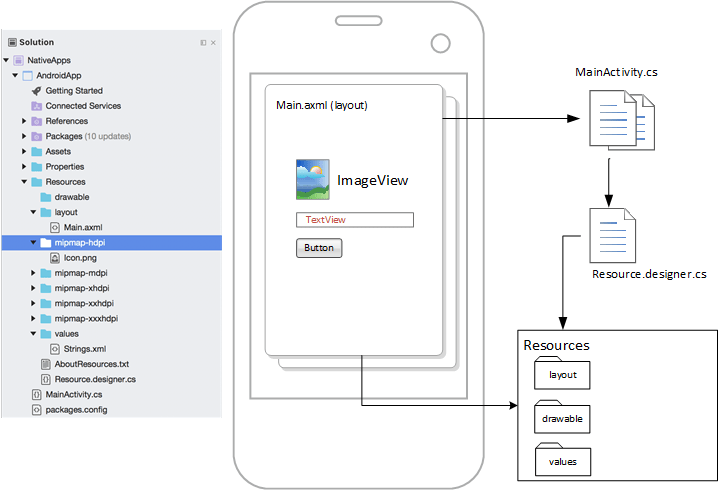 Figure 6 highlights how the MVVM pattern moves the responsibility of handling view data and events into view model classes and away from activities and view controllers. The view model classes then reside in shared code, which is referenced by the application projects, leaving the activities and view controllers with the platform specific responsibilities. The connection between the view and view model components is handled via data binding which ensures properties and methods on the view model are wired up to the view controls. Apart from code reusability. another advantage of data binding is that the view reflects the view model’s state through two-way binding. Consider the example of a price calculator, updating the gross amount view will feed through to the view model, causing the net value to be recalculated, which will automatically reflect on the view. Figure 6does highlight one problem with the MVVM approach that needs to be addressed. The example shows the application saving a photo which will require the device to handle taking one first. The code to handle saving now resides in the shared code but the platform specific libraries that handle taking a photo are referenced by the application projects. How can the view model pattern be implemented to handle platform specific functionality? Shared projects provide a mechanism for including platform specific code by using conditional compilation. Android and iOS projects have default compilation symbols configured which can be used to include platform specific code. Shared projects are different to class libraries as they act more like extensions to the projects that reference them, thus they have access to the libraries referenced by those projects. The compilation symbols can be used to implement platform specific code in the same area, which is then pulled into the specific project during compilation. There are several MVVM frameworks that are available for Xamarin development. and are commonly used examples, which also provide IoC container support, but there are others available that may better suit your needs. As Xamarin.Forms is based on the .NET framework and XAML it can also be used to create the UI experience of applications targeting Windows devices. 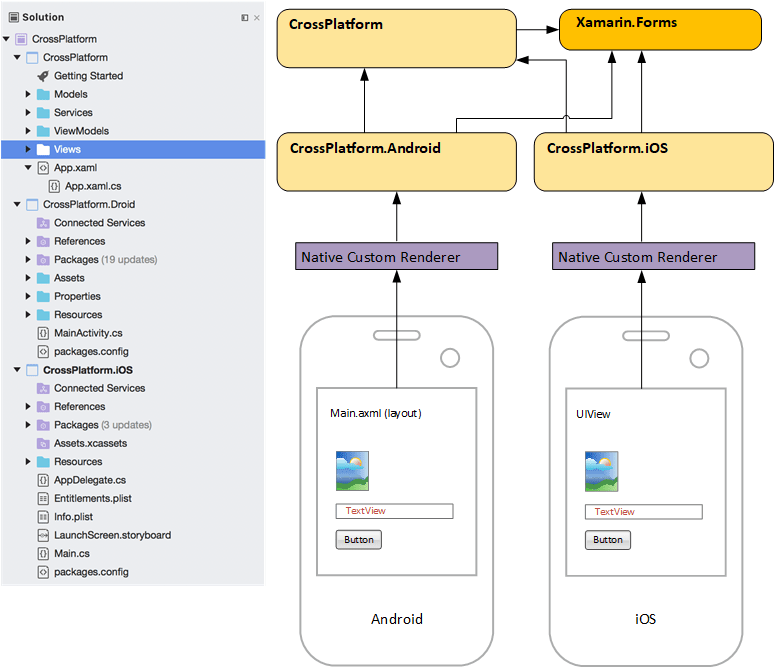 Apart from reusability, another advantage of using Xamarin.Forms over native Xamarin application development is that MVVM support is built in out of the box through simple refactoring of the XAML mark-up and associated view models. However, although Xamarin.Forms will handle most requirements there may be limitations when developing against specific platforms. Xamarin.Forms does provide extension through custom renderers but this may potentially create greater complexity in your application which can often be better implemented using the native approach. The techniques and options covered show how the responsibility of the native application projects can be limited to managing only platform specific functionality and resources leading to better separation of concerns, and consequently higher code reuse and productivity.